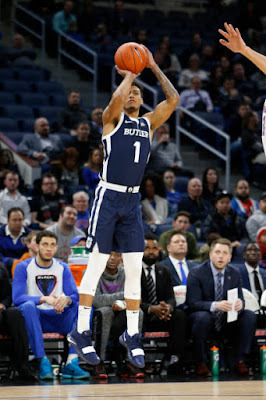 In a game which saw 11 lead changes, the Butler Bulldogs (11-7, 2-3 Big East) unleashed a perimeter attack in the second half, which proved to be too much for the DePaul Blue Demons (10-6, 2-3 Big East) in an 87-69 win at Wintrust Arena. Here are my five takeaways from Chicago. With multiple lead changes within a close stretch from the end of the first half to the early stages of the second half, Butler’s three-point barrage provided a much-needed cushion to go up 16 points at the 12-minute mark in the second half. Four consecutive three-point makes from Aaron Thompson and Jordan Tucker with two each, highlighted a 13-of-28 night from long range, which lifted the Bulldog fans and bench to their feet. Butler shot 71.4 percent from the field in the second half and Leitao did not like the lack of urgency from DePaul’s defense. “We were chasing the ball around and late to a lot of our assignments, whether it was ball-screen or transition defenses, there were a lot of aspects that was late and Butler did a great job of moving the ball around,” Leitao said. In need of more consistent scoring outside of Baldwin, Tucker put together his best game to date for the Bulldogs with 19 points, on 5-of-8 from long range. The Duke transfer saw Wednesday’s night performance as a harbinger of things to come in conference play and credited Butler coach LaVall Jordan in believing in him from the first day he stepped on campus. “Coach [Jordan] has been on me about being more comfortable in the offense and working on development, which paid off tonight,” Tucker said. Butler’s success in the Big East and a potential fifth straight NCAA Tournament bid will hinge on players like Tucker, Sean McDermott and Aaron Thompson to turn in more consistent performances on a nightly basis. Known primarily as a scorer, Kamar Baldwin was active at or near the paint as he grabbed a career-high 14 rebounds, to go along with 17 points for his first career double-double. 10 of Baldwin’s 14 rebounds came in the first half, which allowed the Bulldogs to get second chances and remain toe-to-toe with the Blue Demons. Baldwin deferred to his teammates for being in their proper spots, which allowed the junior to get the rebounds at precise times. With Jaylen Butz and Jalen Coleman-Lands out due to injuries, forwards Paul Reed and Femi Olujobi carried the scoring load for DePaul. Olujobi left off from a 27-point outing at St. John’s on Jan. 12, with 23, on 9-of-13 shooting and 2-of-3 from long range, while Reed finished with a career-high 20 points. Despite Olujobi’s breakout in Big East play, DePaul coach Dave Leitao knows it will take more than the frontcourt to have a chance to win more games. The previous meeting between the two schools at Hinkle Fieldhouse on Feb. 3, 2018 saw Butler contain DePaul sharpshooter Max Strus as he was held to eight points. Wednesday night proved to be more of the same as Strus finished with 12 points, on 1-of-7 from three-point range. Strus would not be the only shooter handcuffed as Devin Gage and Eli Cain finished 1-of-8 and 3-of-17 from the field, respectively. “There were a lot of shots we took that was not off good ball movement,” Leitao said of DePaul’s shooting woes.